At the eleventh hour, Christie’s has taken the decision to withdraw the headline lot from the December 13 Books and Manuscripts sale in London after serious doubts were expressed over its authenticity. The ‘rediscovered’ fifth copy of Martin Waldseemüller ’s globe gores c.1507 had been estimated to bring £600,000-900,000. Christie’s specialist Julian Wilson has said the department now believes the evidence “supports assertions that a photograph was used to create a photomechanical reproduction”. According to the New York Times, in recent weeks a group of academic and dealers in the US suggested that the map – the first ever to use the name ‘America’ – might be a copy. Three points of evidence were particularly problematic for a supposed woodblock print: areas where the printed image was either quite heavy or missing altogether; the over-printing of glue on the paper surface and the ghostly line in the image that appears to replicate a tear. The latter was noted by Nick Wilding, a rare-book expert at Georgia State University who in 2012 exposed an ‘ancient’ copy of a work by Galileo, as fraudulent. 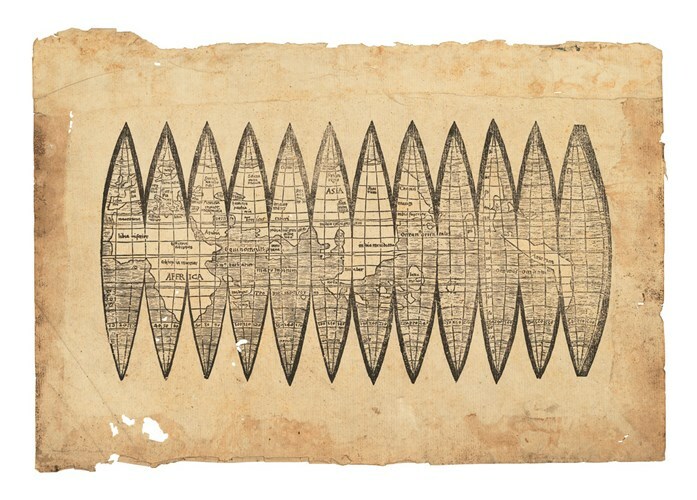 Wilding believes the white line in Christie’s map follows a historic repair in an authentic print residing in the James Ford Bell Library at the University of Minnesota. Another version of the map in Munich in the Bavarian State Library is also understood to carry this ‘tear’ line and it too will now come under scrutiny. It was bought by the library from the estate of the dealer-collector HP Kraus in 1991. Christie’s map came with relatively little in the way of provenance. It came in over the counter from a gentleman who inherited it from a British paper restorer. The auction house made the decision to withdraw the map after Wilson travelled to Minnesota to reviewed the two maps side by side. Produced in 1507, the printed segments or gores of Waldseemüller ’s map would have made up the first recorded printed globe, one that not only named America but also illustrated both South and North American continents and a separate Pacific Ocean for the first time. The globe, even with a diameter of just 4.5in (12cm), offered a new and more accurate picture of the world in 360 degrees. The gores took into consideration the accounts of Amerigo Vespucci, who in 1499 had voyaged further down the South American coast than earlier navigators and realised that the continent was far more extensive than had previously been believed and might be separate from Asia.